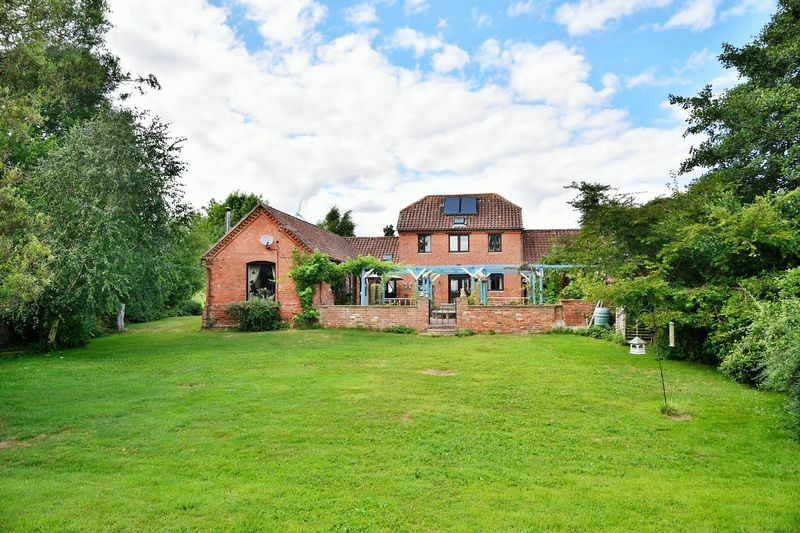 A characterful and beautifully presented detached country 5/6 bedroom period family home with spacious annexe encircled by gardens with stable block. 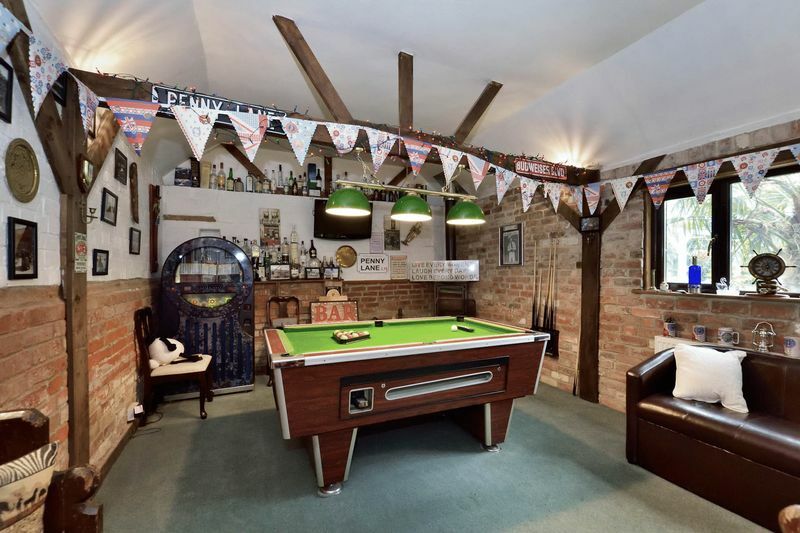 Built in the 1820s, The Granary is a lovely period property retaining exposed beams and several features of its working past. 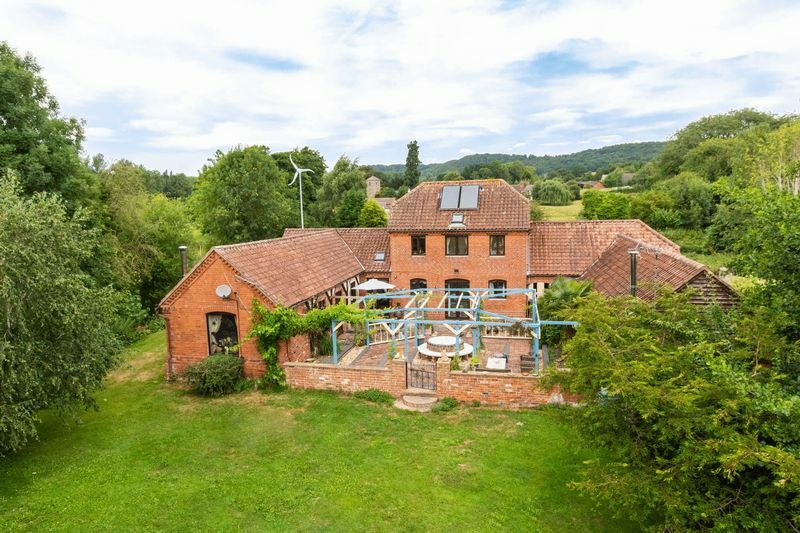 It offers a peaceful country family home of exceptionally malleable living space orientated around a private Courtyard, able to satisfy the most rigorous demands of modern family life; for perhaps media room, gym or yoga retreat with even stabling for pony-mad youngsters. 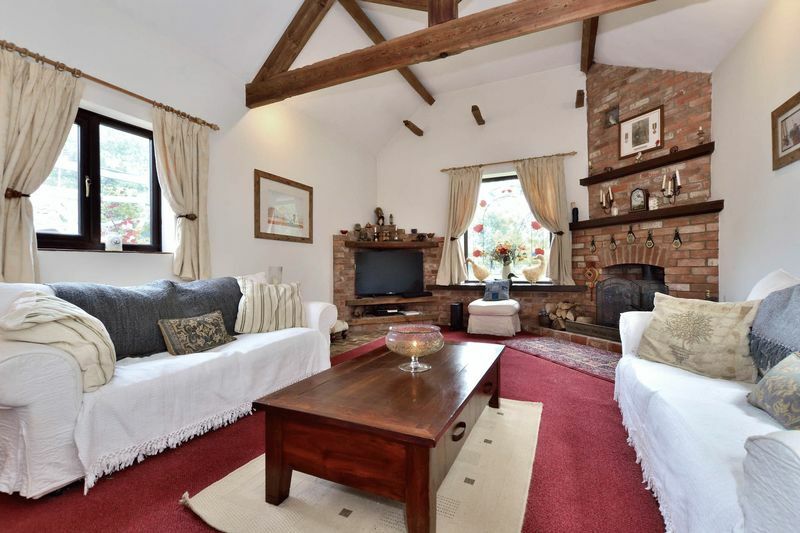 With a further spacious and easily self-contained Annexe even multigenerational living can be accommodated with ease. While solar panels and a small wind turbine drastically reduce energy costs. 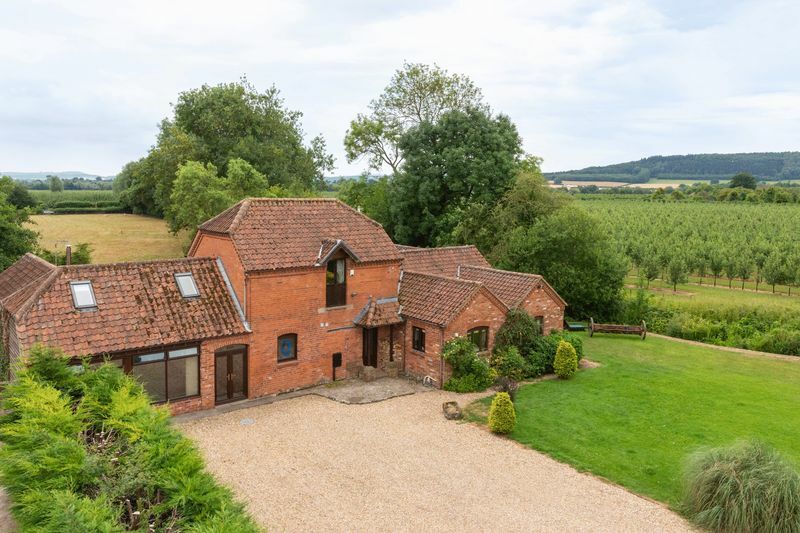 A quiet oasis located down a long driveway, the house is surrounded by gardens with wider views across to the mediaeval church tower, young orchards and open countryside. 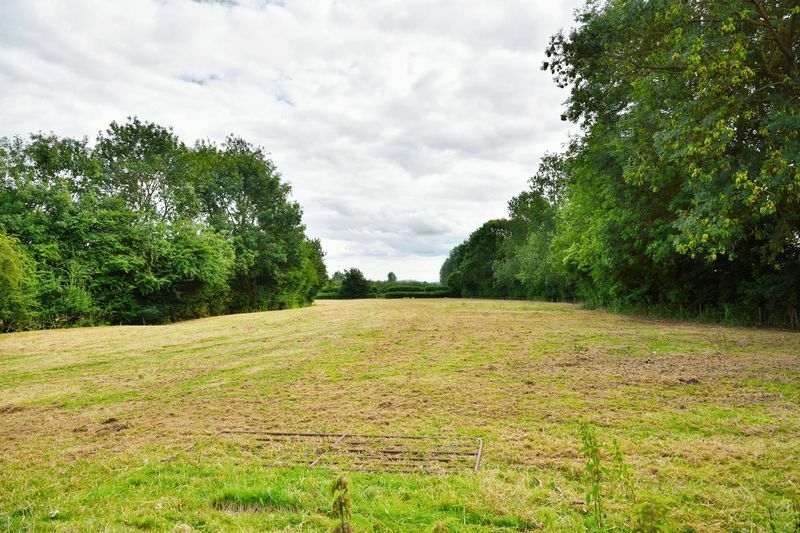 [An adjacent 3acre field would be available to rent for equestrian purposes.] 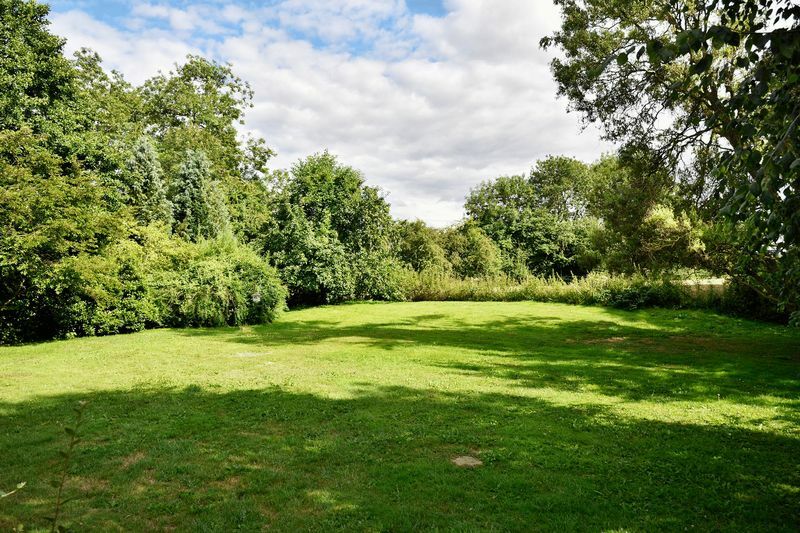 Credenhill lies only 2miles distant and provides general store with post office, sports facilities, community centre, Ofsted ‘Good’ primary school and excellent Chinese restaurant. 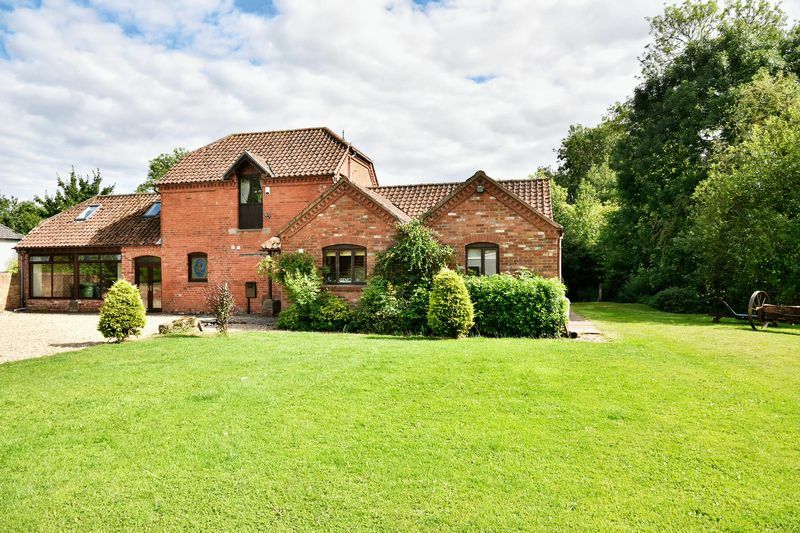 The market town of Kington is 12miles away, home to one of two nearby golf courses while the full city amenities of Hereford are only 7miles. 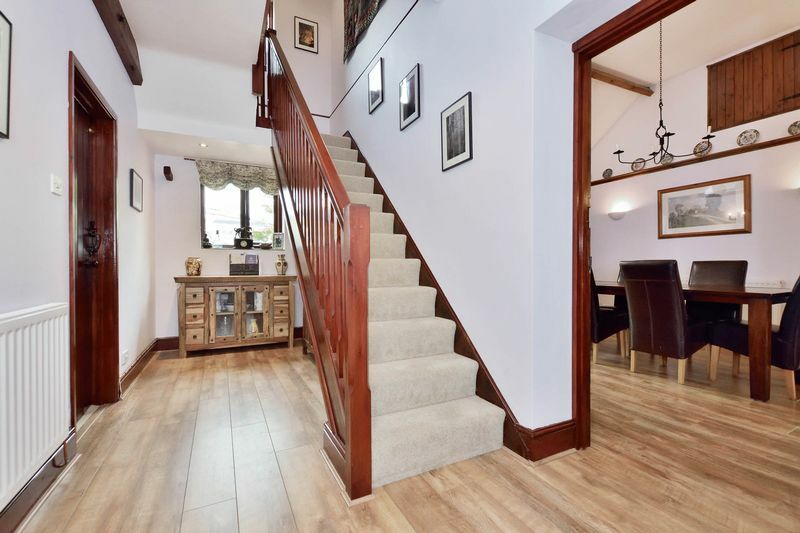 Entrance Hall – The Front Door opens into a wide Entrance Hall with rich-hued engineered hardwood flooring running through several of the downstairs rooms. 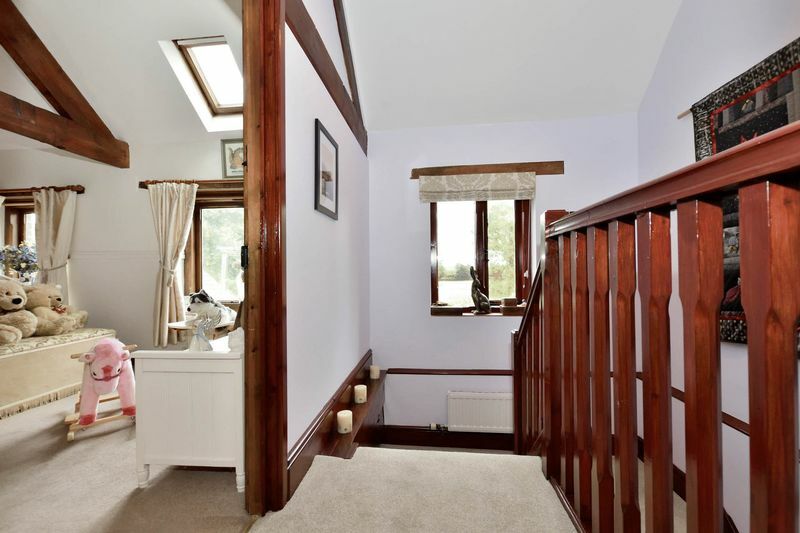 Off to the side lies the Downstairs WC. 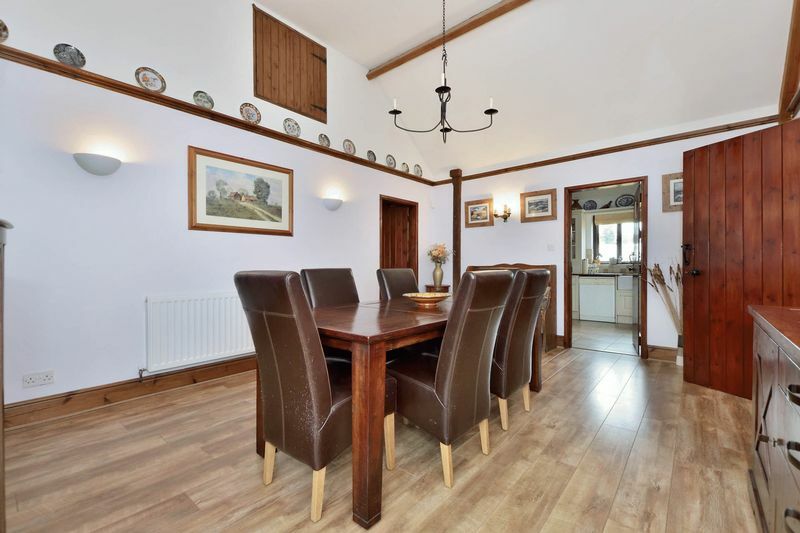 Dining Room – With high pitched ceiling displaying exposed beams the Dining Room is grand space with French doors leading directly out into the private rear Courtyard, a suntrap ideal for Outdoor Dining. 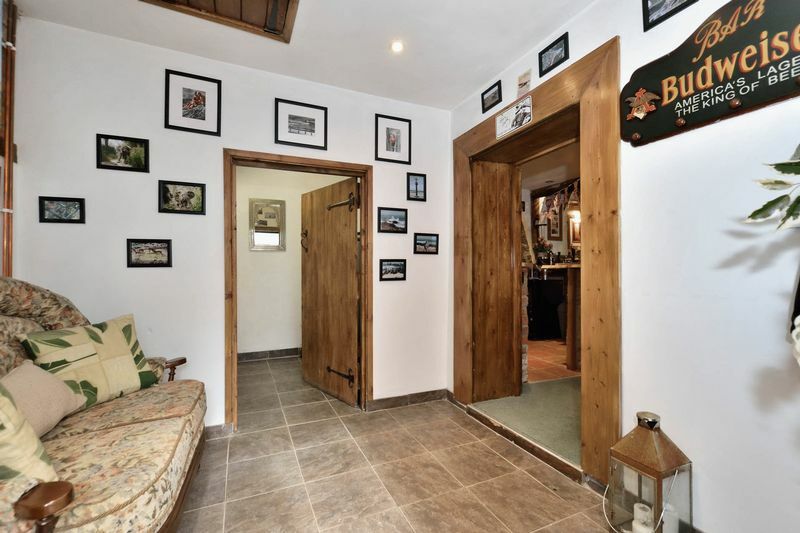 While a high, timber hatch door accesses a large storage loft. 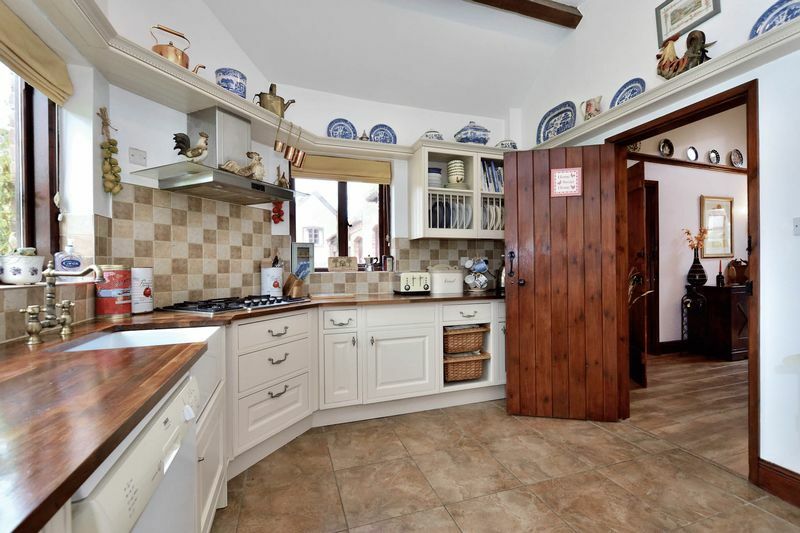 Kitchen/Diner – The spacious country Kitchen with tile flooring, is fully fitted in an array of cream units including wicker basket drawers, glass-fronted display cases and plate racks, completed with solid wood countertops. 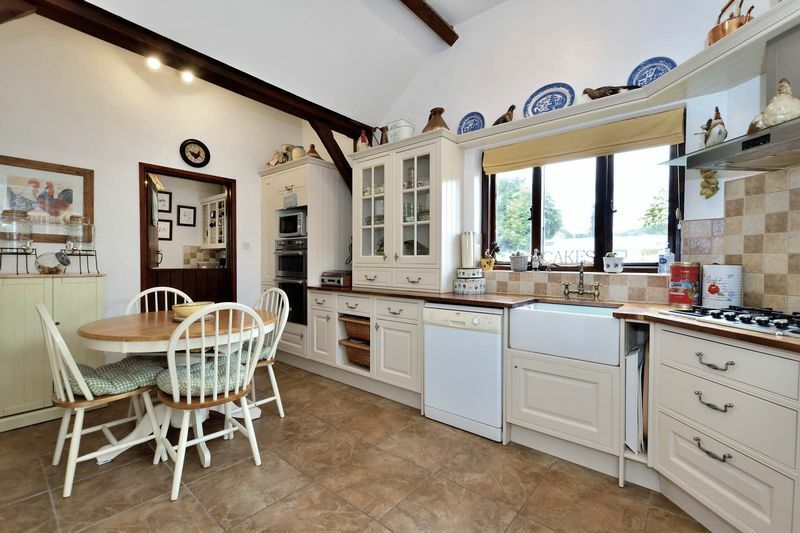 Integrated are double oven and LPG 5burner gas hob with stainless steel hood above. 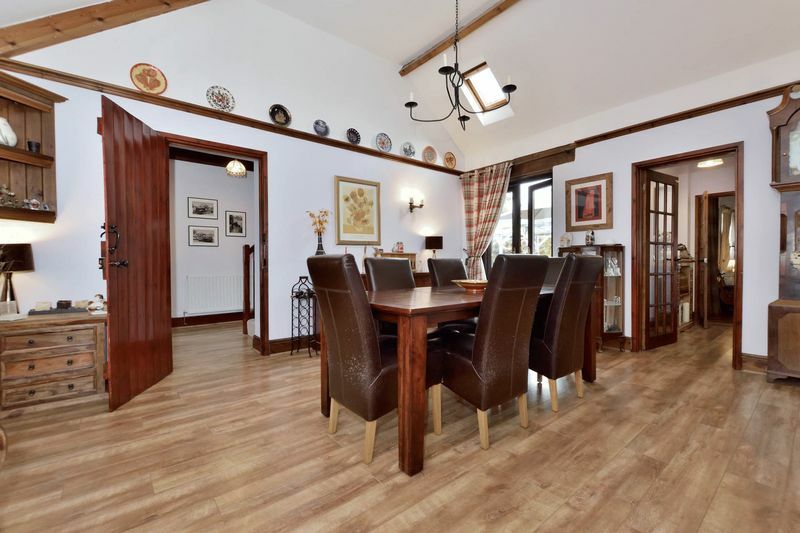 There is built-in space for both dishwasher and microwave, while the Belfast sink is set beneath one of two windows and enjoys views across the front gardens. Utility – Beyond a Stable door opens the large Utility fitted in matching units and providing ample storage with double full height cupboards. 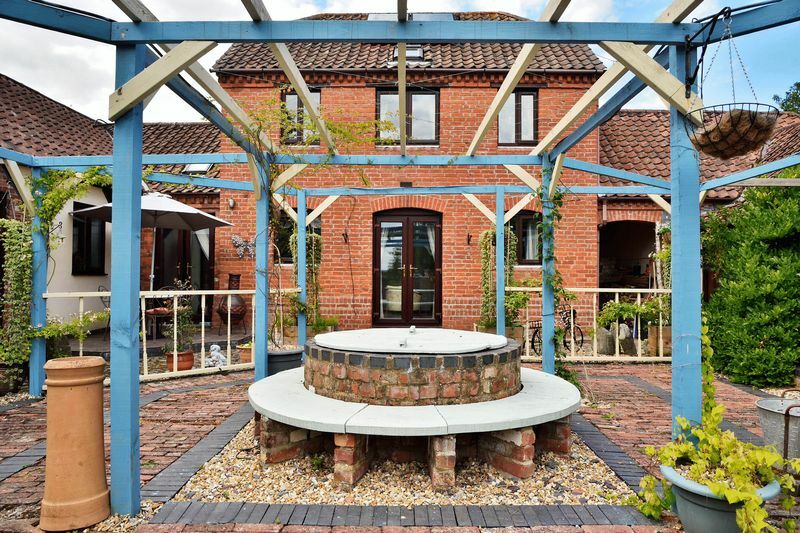 With further units around the ceramic sink and a half with integral drainer, there is also space for US style fridge/freezer, washing machine and dryer while an External half-glazed door leads out into the gardens. Bedroom Four – Off the Dining Room lies a prime example of the malleability of the living space the house provides, with orchard views from the window it is currently used as a Guest Double Bedroom with initially a Walk-in Wardrobe with twin walls of fitted storage yet the room would as easily lend itself to a full working Home Office or Hobby/Craft Room with its copious integral storage. 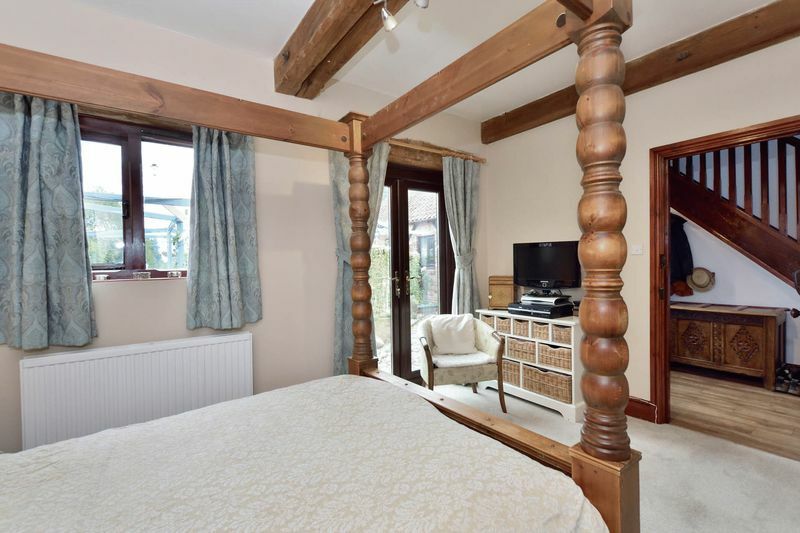 Study/6th Bedroom – Off the Hallway leading from the Dining Room is another malleable room providing a 6th Bedroom or practical study with to the corner a full-height fitted cupboard. 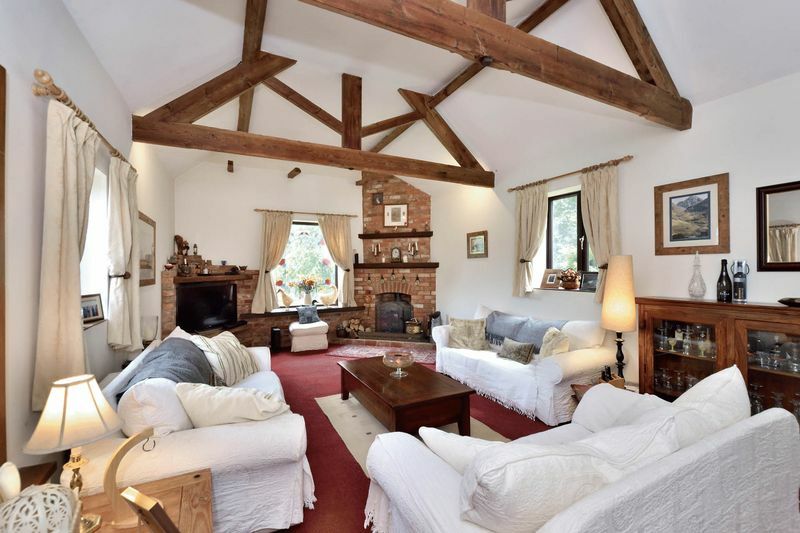 Sitting Room – The spacious Sitting Room enjoys a vaulted ceiling with triple, exposed frame beams and triple aspect windows with views across the surrounding gardens. 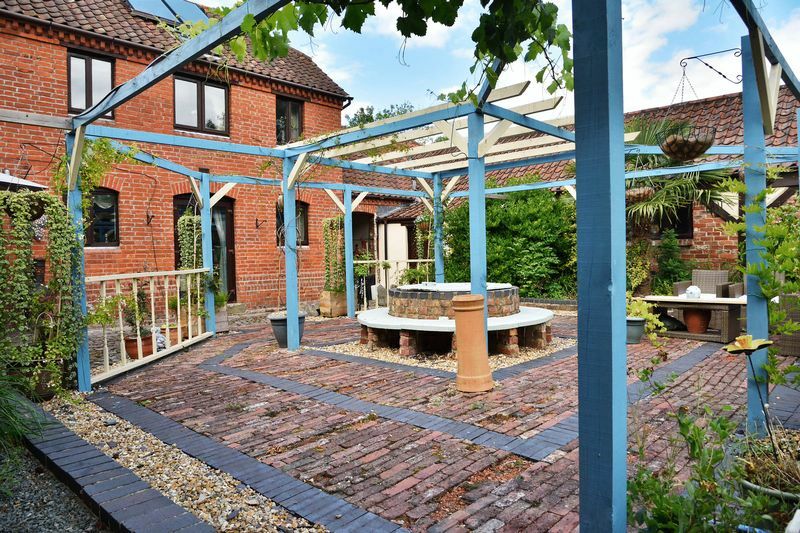 The room is made cosy by an exposed brick fireplace being home to a multi-fuel stove, while the Granary’s original timber door leads out into the Courtyard. 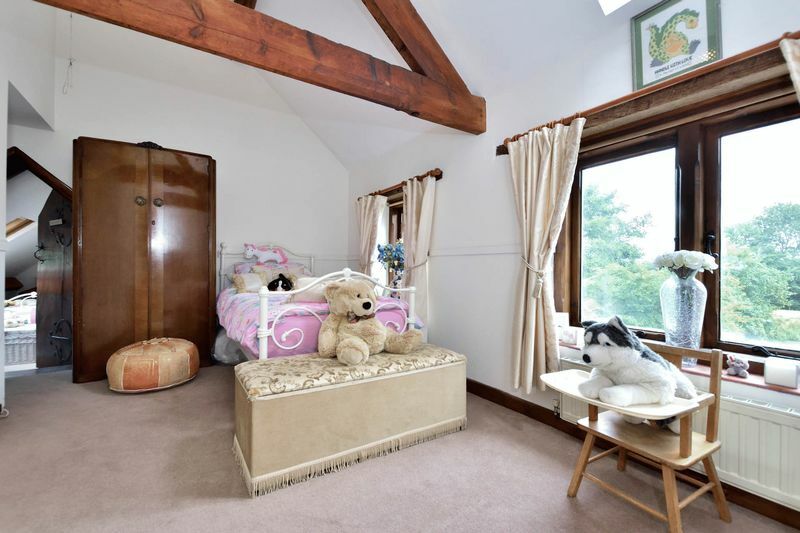 Bedroom One – The carpeted Master Bedroom benefits from French doors leading out into the Courtyard and also provides built-in double wardrobe with cupboards above. 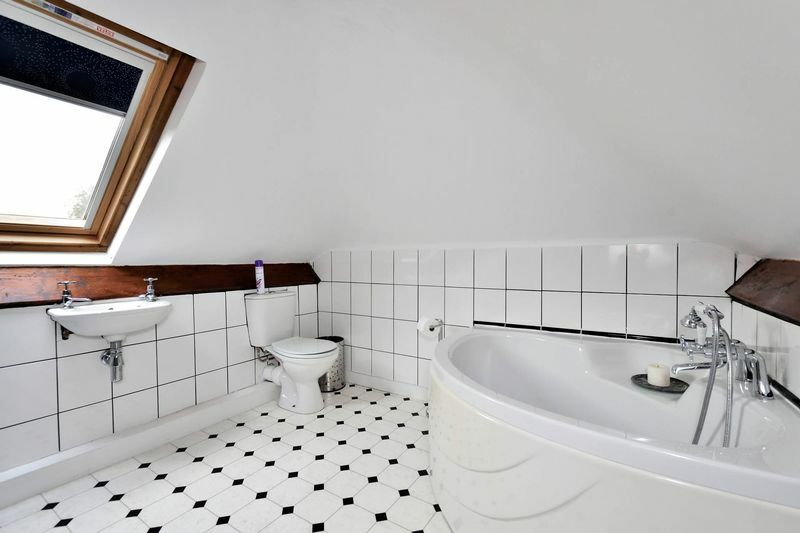 The Ensuite is completed with large shower cubicle, WC, heated towel rail and round stone basin set atop a storage unit. A decoratively arched alcove to the side is fitted with open display shelves above a built-in cupboard. 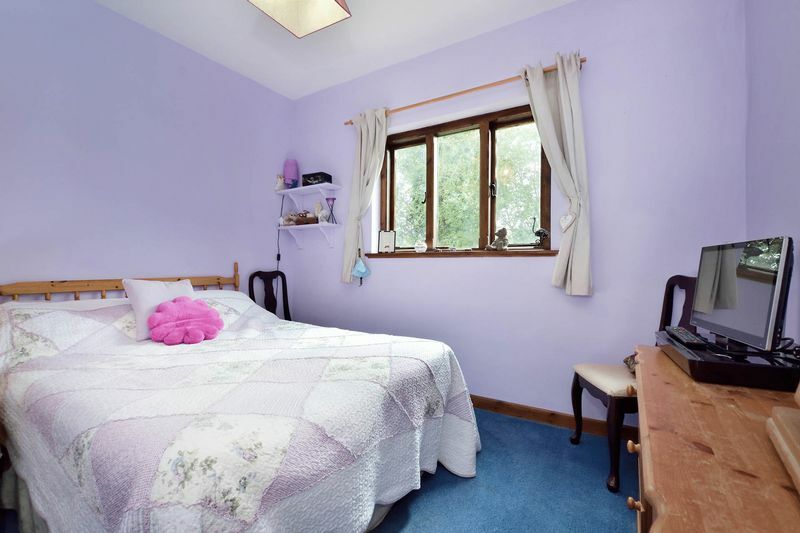 Bedroom Two – The carpeted Double room is a walk-through Bedroom and enjoys twin windows overlooking the Courtyard. 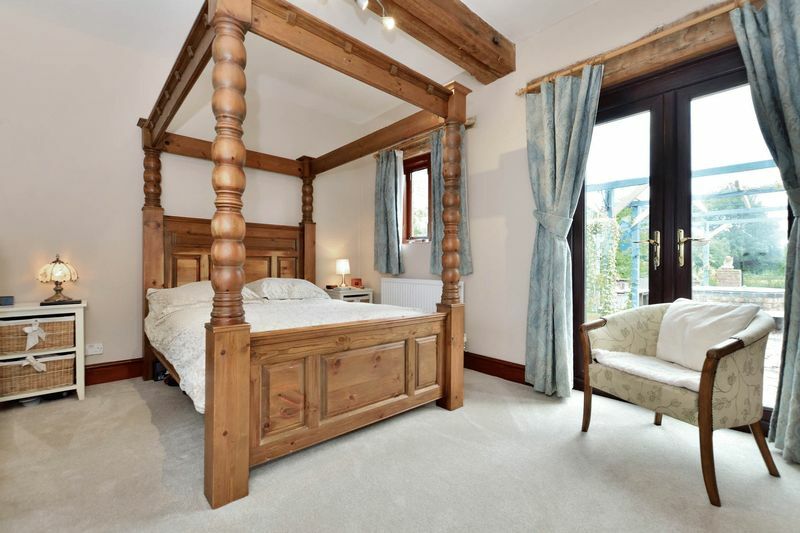 Bedroom Three – The carpeted Double Bedroom has a fitted double wardrobe with twin drawers below and cupboard above. 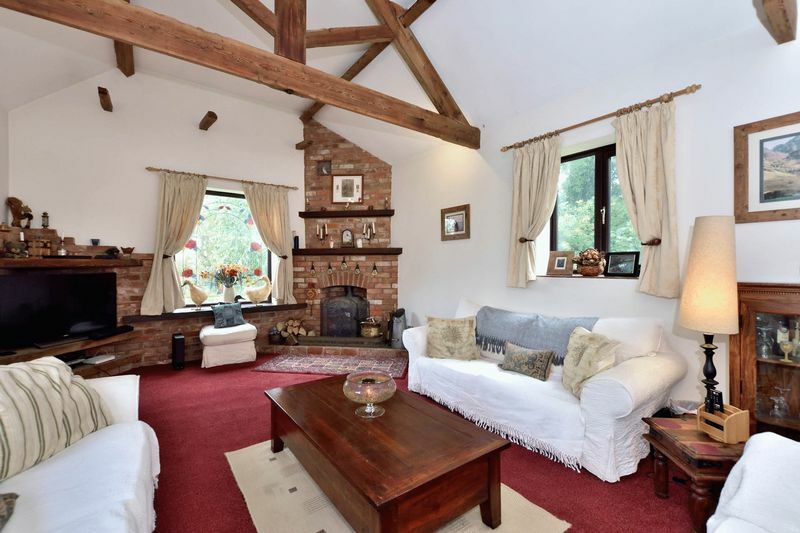 It features exposed beams and has a window with views across the front. 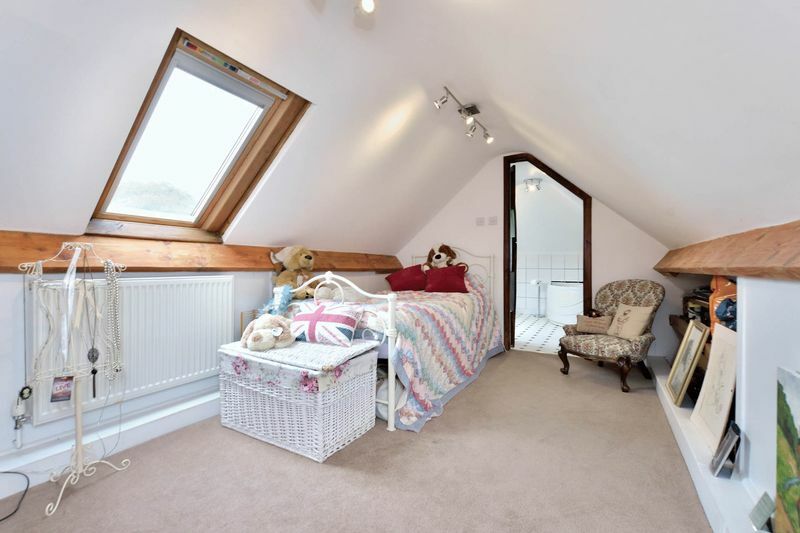 Bedroom Five – The carpeted Single Bedroom opening beyond Bedroom 2 has a vaulted roof with a Velux with integral blind and to the side a low exposed beam with open, under-eaves, fitted shelf storage. 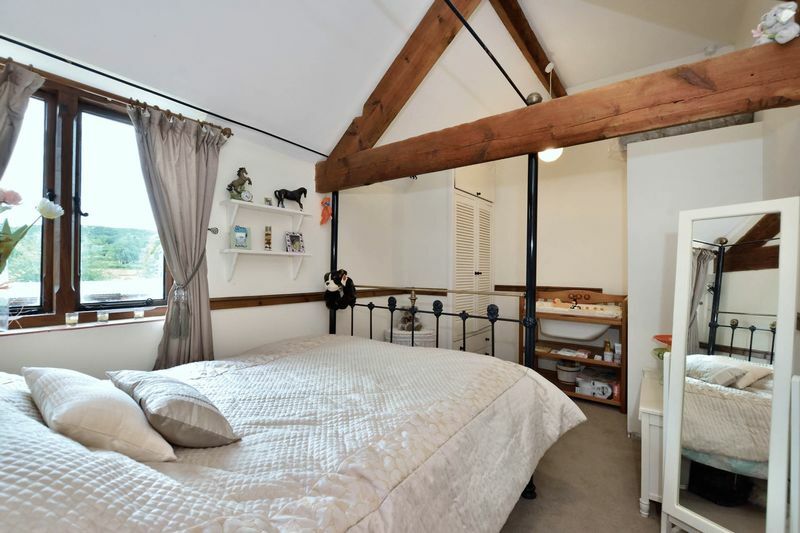 Yet another malleable space, it offers an ideal playroom for younger children and combined with Bedroom 2, a dream suite for teenagers providing a private study and relaxing space. While beyond opens the monochrome Ensuite Bathroom featuring corner bath with mixer tap and shower attachment, WC and wall-mounted basin. 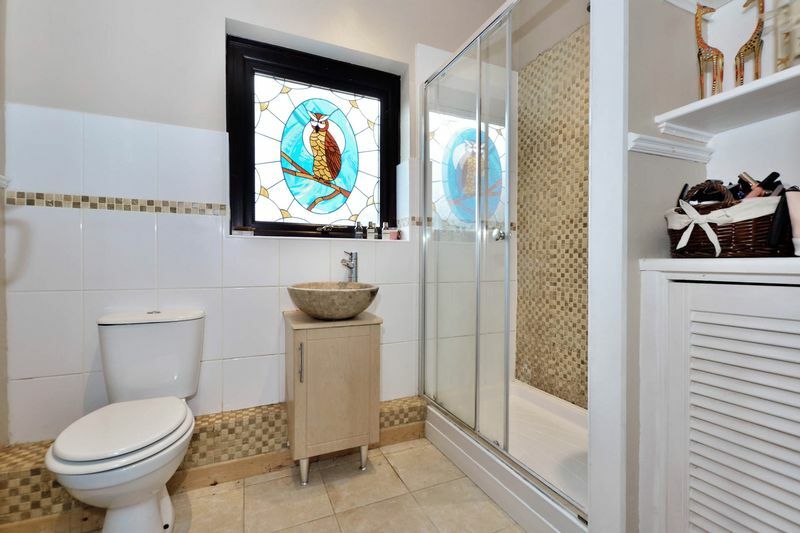 Family Bathroom – The Bathroom features a full curved end bath with wall-mounted shower and glass screen, the suite is completed with WC and pedestal basin. 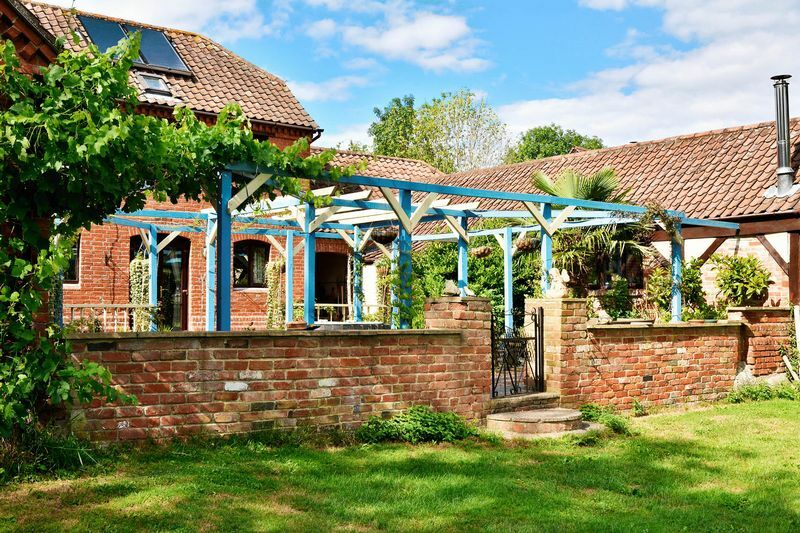 Airing Cupboard – The Airing Cupboard with fitted batten shelving is home to the solar panel meter display, with the cold water tank above. 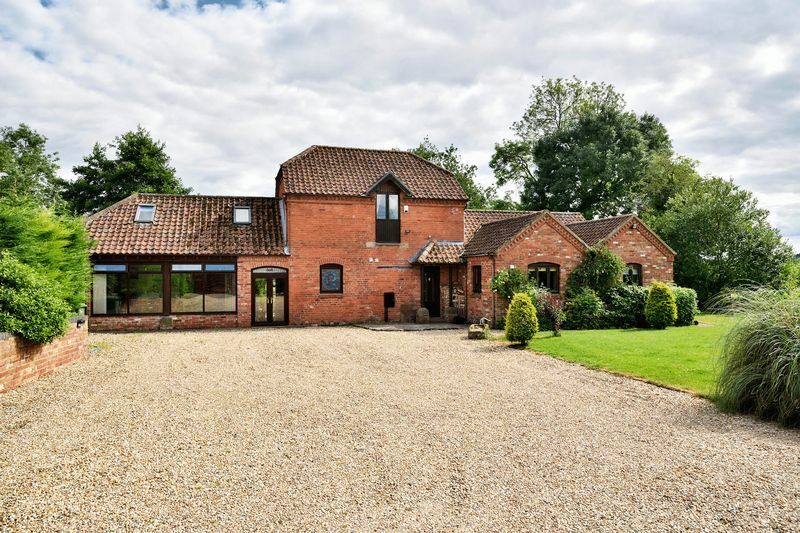 Accessed either from the rear Courtyard or from the Driveway via a glazed-fronted covered Passageway providing dry storage particularly useful for logs, the Annexe’s timber door opens into a wide tiled Entry Hall. 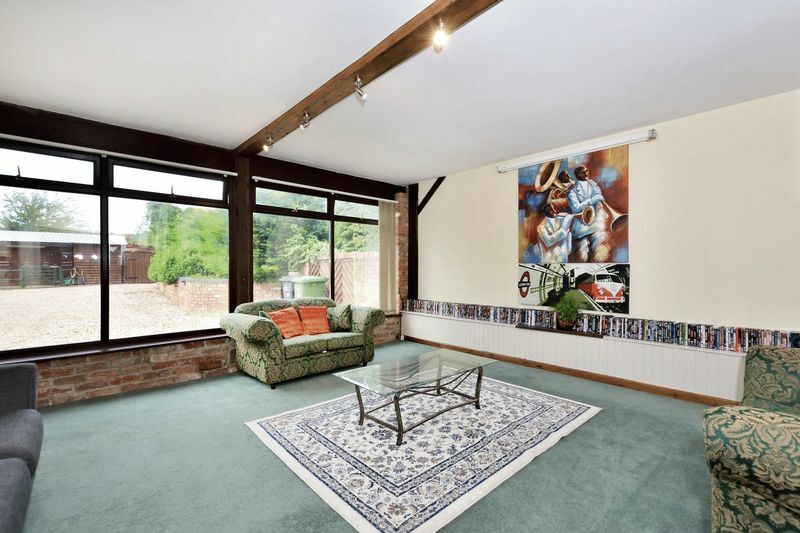 To the left lies the spacious Reception Room with wall of glazing fitted with blinds overlooking the front driveway. 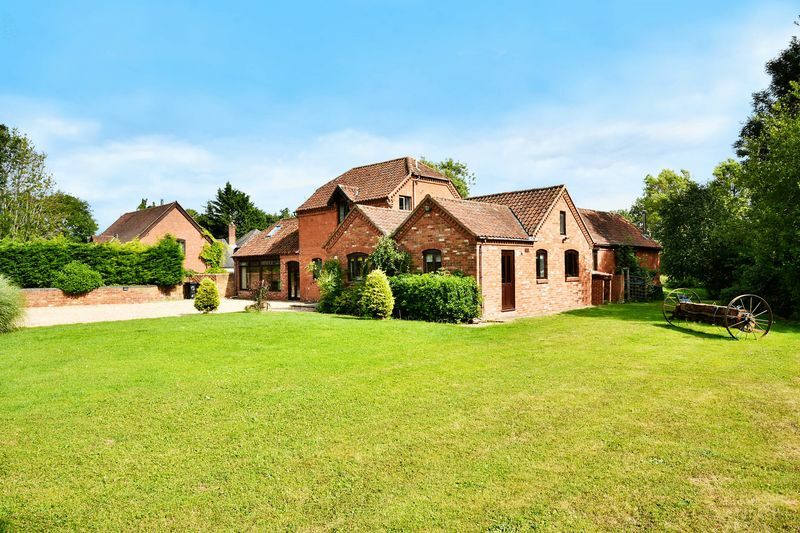 It provides an obvious Family Entertainment/ Media Room ideal for watching movies on a giant screen or as an expansive open-plan Living Room with Kitchen/Diner for a self-contained Annexe. 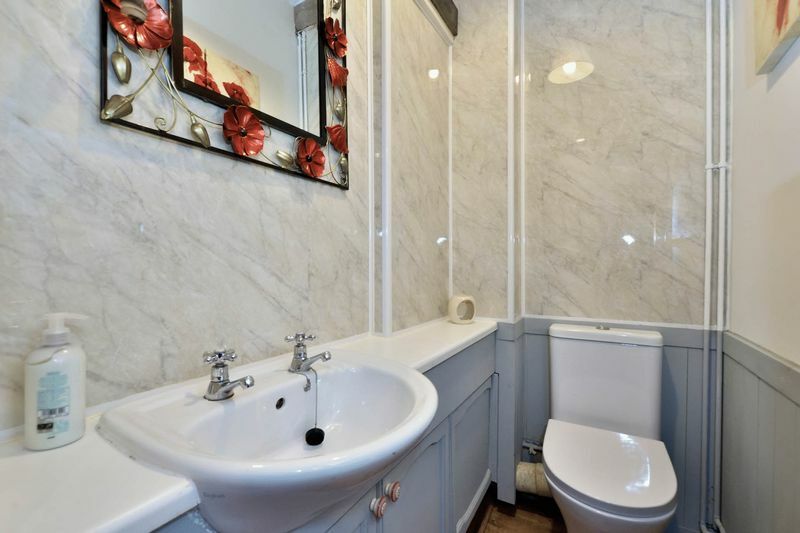 Off the Entry lies a large Downstairs WC/ Utility with Saniflow WC, Belfast sink and ample space for fridge and freezer, it could be easily converted into a full Bathroom. 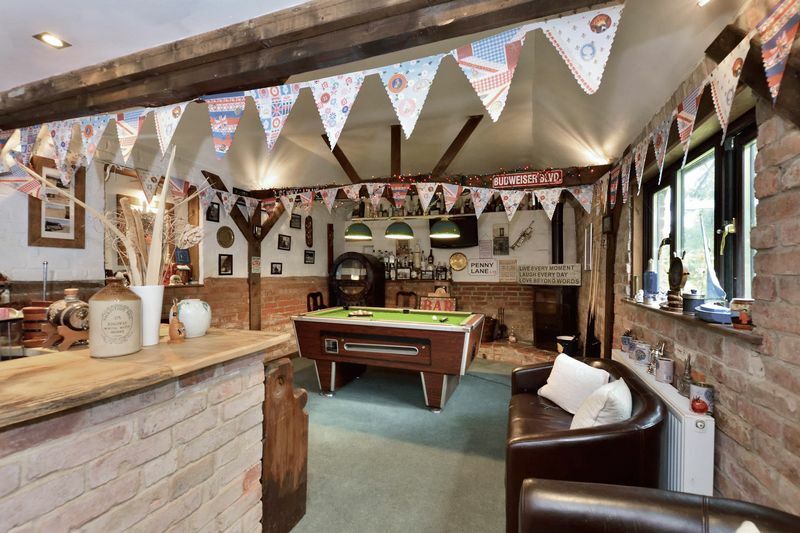 The Games Room offers the ultimate party retreat with space for pool table and featuring a full bar with solid wood counter, while to the corner is a freestanding woodburner. 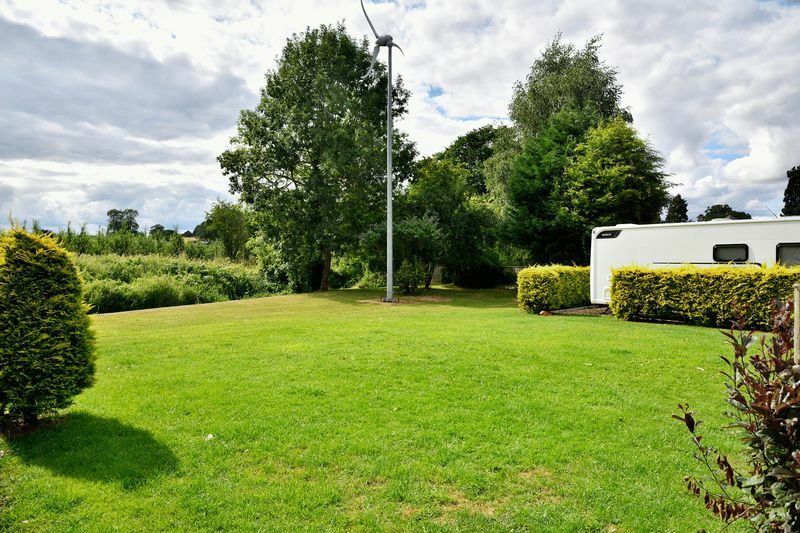 Beyond the secure electric metal gate opens the front Driveway with ample parking and discreet hedged bays for caravan or horsebox. 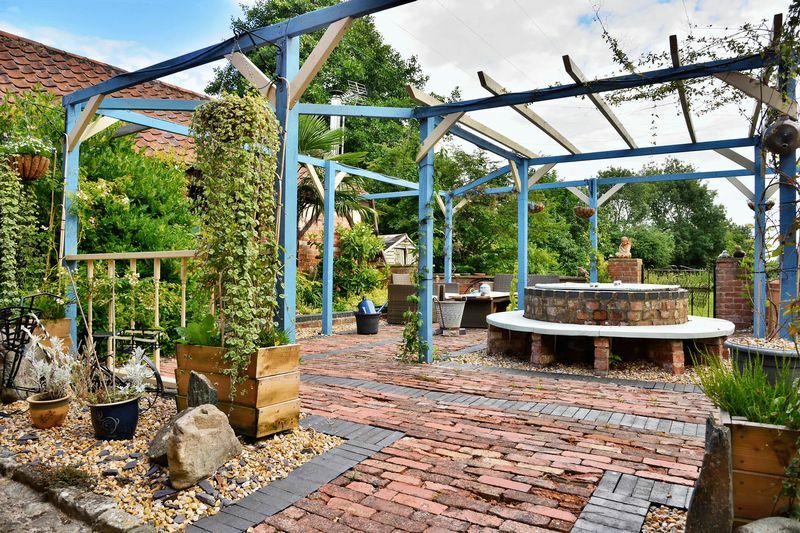 The rear brick, suntrap Courtyard is framed by an extensive wooden pergola ideal for perfumed climbing roses and clematis to scramble up and provide shade for outdoor dining with a backdrop of open fields. 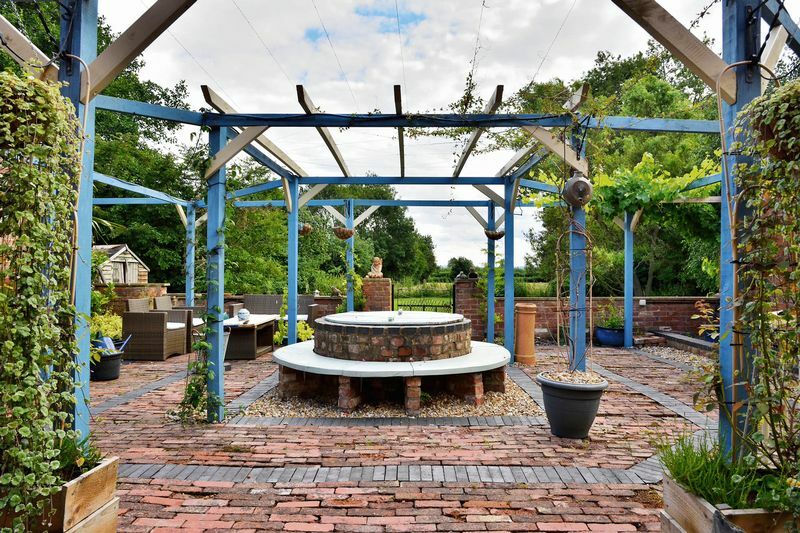 To the centre retained as a feature with surrounding seating and with a shallow illuminated top lies the original, now dry, well site with wooden cover. 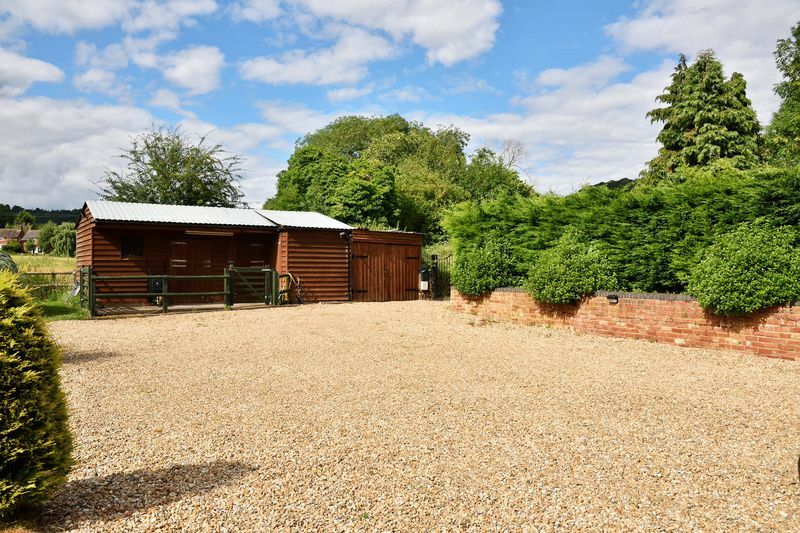 The Stable Block with light and power provides 2 loose boxes with Tack Room while attached is large Shed ideal for garden storage. From Hereford take the A438 Brecon Road and turn right off Kings Acre Road onto the A480 towards Credenhill/Kington. Take the second exit off the roundabout and continue straight for 3miles. Turn right for Mansel Lacy and take the first left turn onto the shared driveway. The property is to be found at the end of the right fork.